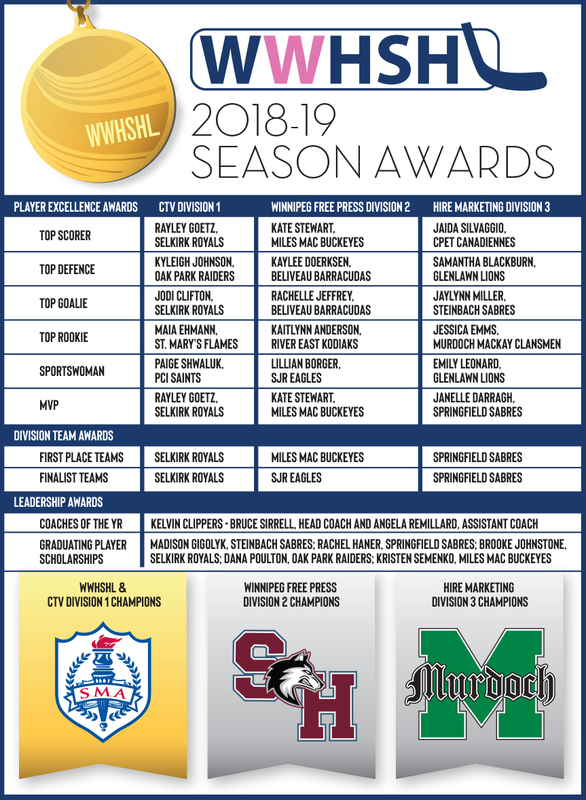 This season's Award nominees and winners were honoured at the 23rd Annual WWHSHL Excellence and Leadership Awards Gala held on April 10, 2019. Michelle Gerwing, CTV and Taylor Allen, Winnipeg Free Press Sports, welcomed a record crowd over 550 to celebrate the fire and passion of the season, and the many accomplishments of players, coaches and teams. to our co-Emcees Michelle Gerwing, CTV and Taylor Allen, Winnipeg Free Press Sports, and to Karen Taraska Alcock, Hire Marketing, representing our division sponsors. Their financial support helps us to reach our goals and advance female high school hockey each season. to all coaches, officials, volunteers and fans for contributing a significant amount of time to ensure the delivery of a top quality program for the benefit and enjoyment of all our players! We also wish all graduating players every success in their future endeavors. If you are interested in staying involved as a referee, please contact Ken Lazaruk, RIC. We'd love to have you! Congratulations again to all 2018-19 nominees and award winners (below)! >> View Gala photos in our albums.